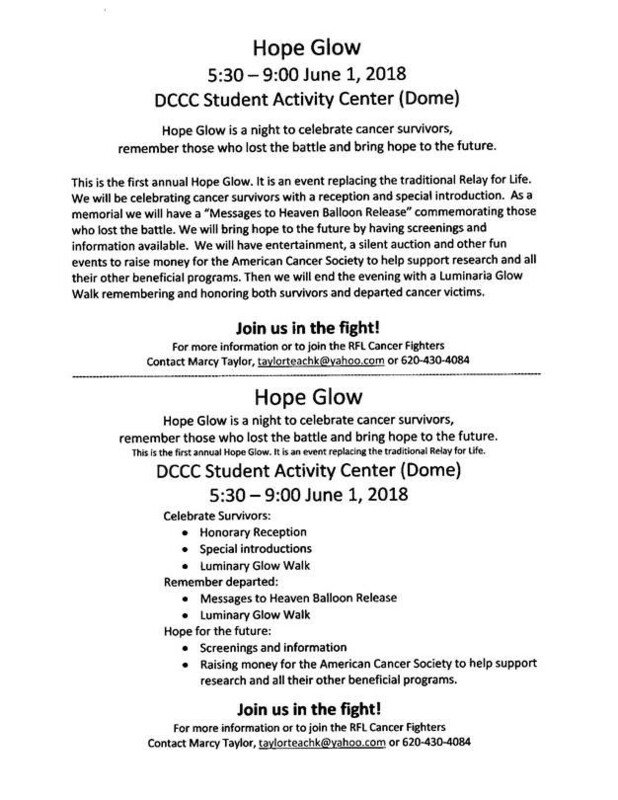 Relay for Life will be hosting a “Hope Glow” event at the DC3 Student Activity Center on Friday, June 1st, from 5:30 PM to 9:00 PM. Hope Glow will celebrate cancer survivors with a reception and special introduction. There will be a “Messages to Heaven” balloon release, in commemoration of those taken by cancer, and screenings and information will be available to spread awareness and encourage early intervention. Also included in the event will be entertainment, a silent auction, and other fun activities to raise money for the American Cancer Society. The evening will close with a Luminaria Glow Walk remembering and honoring both survivors and those lost to cancer. For more information on how you can get involved, contact local event chair Marcy Taylor at taylorteachk@yahoo.com. You may also visit the official Relay for Life website: www.cancer.org/involved/fundraise/relay-for-life.html and look for the event in your area by entering your zip code. The event is listed as: Relay for Life Ford County.